With the Super Bowl right on the horizon it’s time to consider the most important aspect of the game: the menu. Chips and dips have a natural affinity for televised sporting events, and during the Big Game, ‘Super Bowl’ has more than one meaning. No matter what snack you reach for on Super Sunday, you’re going to need something to put it in. The game may be played in the warmth of Miami this year, but when it comes to keeping food fresh, heat is definitely a penalty. The Pampered Chef Chillzanne Rectangle Server overcomes this deficit with its freezable and reversible serving platter. 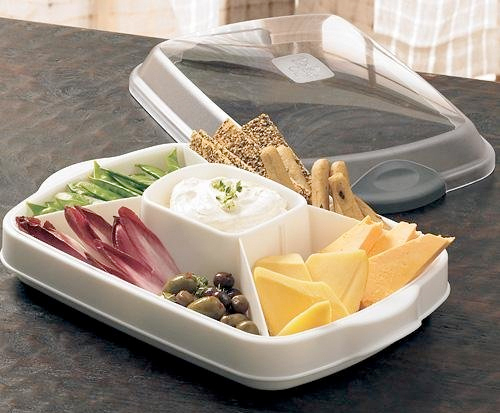 Additionally, it also features compartmentalized serving, allowing for chips to stay on one side of the field, and the dip on the other. For further team play, the flip side of the tray offers indentations for a whole team of (or two dozen, if you prefer) deviled eggs. Come halftime though, there’s no guarantee where the snacks will end up—especially if you’ve been paying too close attention to all those Super Bowl beer advertisements.